Player of Week History 2014/15 | Yankee United F.C. team in the entire league U12-U18 who have not allowed a single goal. defensive team in the entire NPL on the girls side. Easton and Hannah S. from Stratford, CT.
Katie currently lives in Weston, CT and is going on her first full year with U12 Yankee United Reign. 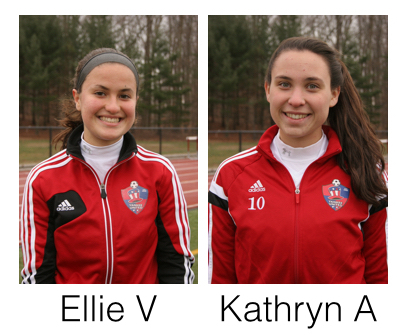 Katie scored 3 important goals this past weekend at the Oakwood Premier Invitational. Katie scored the winning goal against FSC North which lead to a 2-1 victory. Katie scored a beautiful free kick against Celtic which lead to a 3-1 victory. Katie also scored the only goal against Oakwood in the semi-final game giving Yankee a trip to the final. Katie is a versatile player that can play many different positions. She uses her strength and speed to get around players. Coach Rui states "Katie is a very strong player that I can use in defense and offense. She offers a dynamic to our attach with her speed, strength and strong shot. Her celebrations when she scores are one of a kind, but that is Katie being Katie. The team loves her personality." 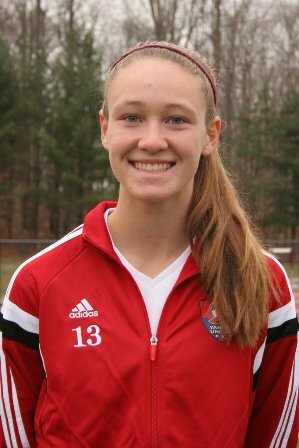 Rebecca is from Weston, CT and has completed her second year with Yankee United. Rebecca made a big impact in each game at the New Jersey Shore Champions Cup Tournament on June 6th and 7th. Rebecca lead Yankee United U-12 Reign in scoring during the tournament with three goals. Rebecca scored two goals against the New Jersey Wildcats which lead to a 3-0 victory. Rebecca also scored the only goal in the third game against PDA which lead to a 1-1 tie. Yankee United Reign ended up defeating PDA in the final leading to a great end of the season for all the girls. Coach Rui states, "Rebecca provides this team with a great presence at the forward position. Her ability to hold the ball and attract defenders to the ball creates a lot of space for other players around her. I have had the privilege of working with Rebecca for these last two years and it is because of her work ethic that she continues to improve. I look forward to seeing Rebecca continue her development and play an important role on this team. " Twin sisters Jennifer and Jessica Hauser were named co-players of the week. Jen and Jess lead their team to a semi final result at the NEFC Tournament College Showcase played at Harvard. In the tournament opener YUFC tied NEFC, the 3rd ranked team in Massachusetts 0-0, as Jessica and her back line teammates shut down the NEFC attack. In the second game the day Yankee earned a 2-2 draw with Seacoast United, the # 1 ranked team in New Hampshire. Jennifer opened the scoring for the Heat with a tremendous left footed strike inside the right post. Seacoast responded before the half ended with 2 goals staking their team to a 2-1 lead . YUFC pressed numbers forward the last 30 minutes of the game and with seconds remaining Jennifer's corner kick found sister Jessica's head in the box as time expired give YUFC a 2-2 draw.Sundays game vs NEFC SC( RI) featured the Yankee girls creating many chances resulting in Jennifer adding her second and third goals of the tournament.YUFC finished second in their bracket with a 1-0-2 record one point behind the finalist NEFC based on goal differential. Lindsey who is a member of the ODP Regional pool scored 3 goals and one assist at the most prestigious Jefferson Cup College Showcase leading her Yankee team to a 1-0-2 record. Playing in front of over 70 collecge coaches, the YUFC Revolution defeated Reston Virginia 4-1 on the first day with Lindsey scoring and assisting. On Satuturday Yankee FC battled the Region 3 Semi Finalist and #2 team ranked in North Carolina Pittsfield SC to a 2-2 draw. Late in the game Savco tied the score on a ball played over the defense that she ran onto going one on one with the keeper slotting the ball just inside the post. 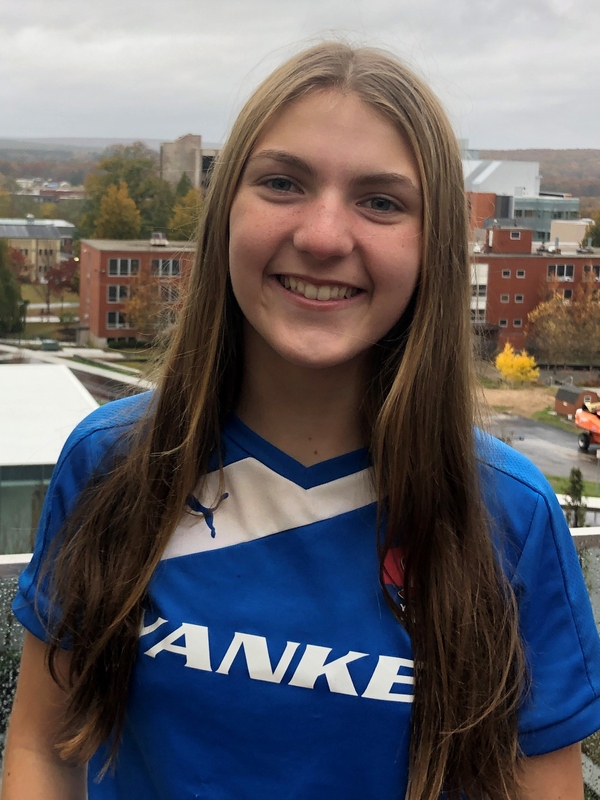 On the final day of the tournament YUFC tied the Jersey Wildcats 2-2 with Lindsay assisting Chelsea Dommond with the game tying goal.The U16 Revolution finished 5th of 12 missing semi finalist status by 1 point based on goal differnetial. With her first season at YUFC, U18 goalkeeper Colleen L. made key saves in their league season opener shutout win (2-0) vs GPS-Ma. Colleen has a strong soccer mind who understands the game and has a knack for making big saves in big situations. This past fall, Colleen led her New Milford High School team to the SWC Girls Championship. 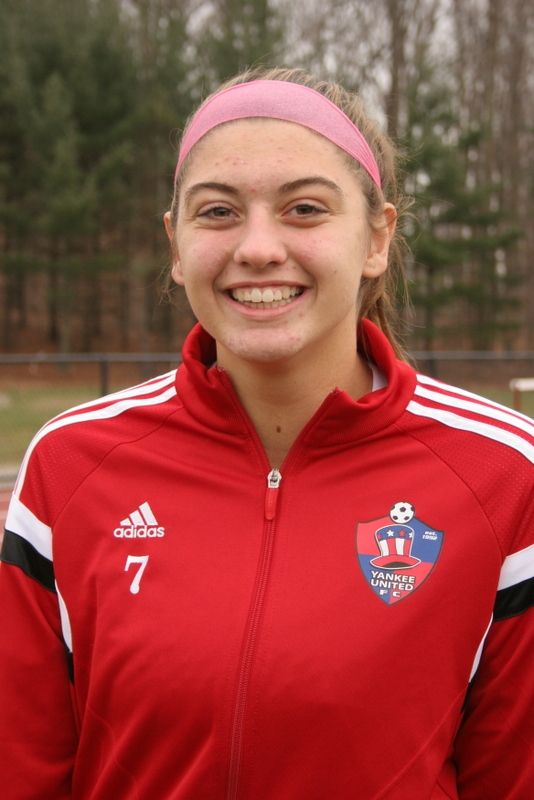 Emma B Goalkeeper for the U16 Yankee United Revolution was named Player of the Week. Emma recorded a shutout in a YUFC 1-0 win versus Seacoast United. She made 6 saves in a stellar effort vs u-16 Seacoast United, the # 1 Ranked team in New Hampshire, #10 in Region1 and 18th Nationally. Emma, a sophomore high honors student, plays varsity soccer at Greenwich High School and is also a 4 year ODP player and aspires to play at the college level. Congrats to Emma and her Revolution teammates on a great win! the U14 Flash and third recorded shutout for Veronica on the season. strong volley and from such a tough angle was very impressive. 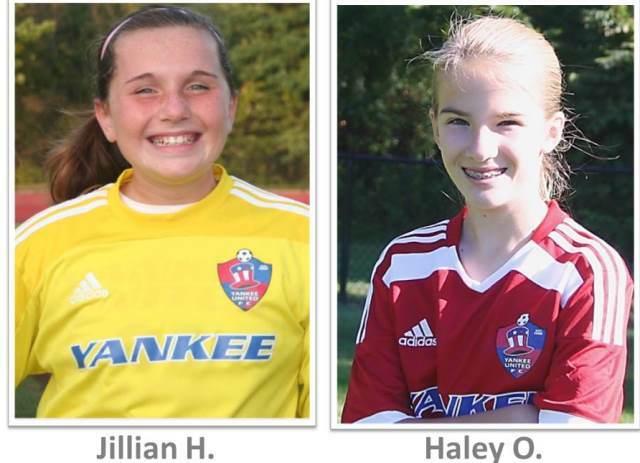 Players of the week Jillian H from U12 Reign and Haley O both performed outstanding this weekend vs Aztec NPL. With 4 games into the season Jillian has only conceded two goals for the U-12 Reign Blue. She has played an important role in keeping her team in every game this year. Jill made some great saves against the Aztec U-12 Girls which resulted in a 3-1 victory. The only goal she conceded was a penalty kick. Coach Rui Rainho states, "Jill has made significant progress this year and it is all because of her work ethic during her training sessions. Jill is getting better and better every game and I am excited to see how much more she will bring to this team in the future. record in the New England Girls NPL Division. Haley O scored a rocket shot from the top of the 18 off the cross bar into the goal to lead the U13 to a 3-0 victory bringing YUFC blast record to 2-0-2 in the league. Coach Mones states "Haley is a hard working attacking player who has a nose for the goal and understands how to be in the right place at the right time" Haley is from Shelton and is with her 2nd year at Yankee United. Maddie Fried has had an exceptional season. She has lead the Yankee United U-12 Reign in scoring this season. Maddie scored three goals against Oakwood this past weekend which resulted in a 4-1 victory. Maddie is a versatile player with great technical and tactical ability. She has great leadership qualities and work ethic. 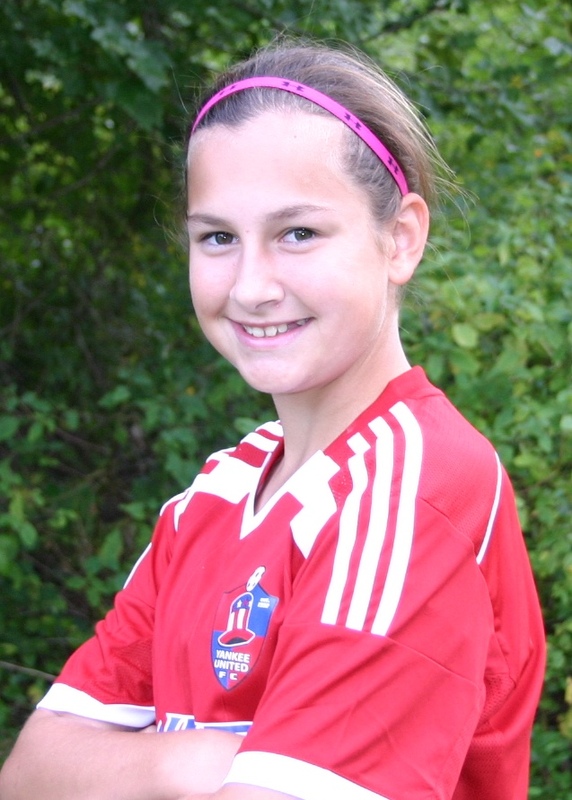 Coach Rui says, "Maddie is a great play maker and has the ability to change games with her finishing ability. Her commitment and drive every week to make herself and the team better is exceptional." Maddie resides in Monroe, CT and has been with YUFC for two years. 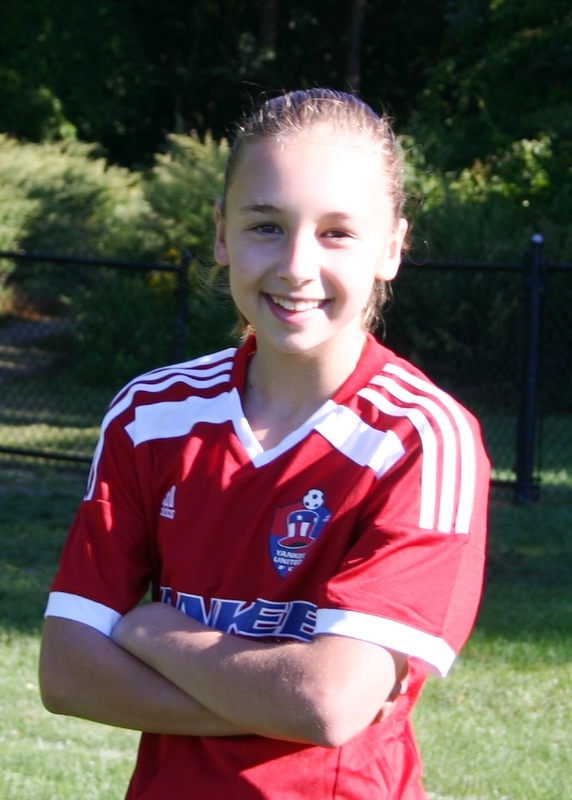 Zoe scored the game winning goal vs FC Stars West U13 in a 1-0 victory for the YUFC Blast NPL-01 at the FC STARS NIKE FRIENDLIES up in Lacaster, MA this past weekend. Coach Mones states "Zoe is very skillful and creative on the ball. She is one of the most versatile and hardest working players on the team. One of her greatest strengths is attacking defenders to create goal scoring opportunities for herself and others"
Zoe resides in Shelton, CT and is in her 2nd year at YUFC. "Leya is an explosive, aggressive and dynamic game changer for our U13 group" states Coach Mones "For a player her age I am so impressed as to how well she anticipates and reads the game. Leya can play anywhere on the field and make a positive impact"
Leya V. scored 3 goals in a 3 - 0 win over Albertson for the YUFC blast this past weekend. Leya is from Shelton, CT and is in her 2nd year at YUFC. Over the past weekend at the NEWSS Women's Showcase Tournament Jessica M. scored a fantastic header from an Amanda R. service into the box to even the score at 1-1 vs BRICK (NJ). Jessica also scored another beautiful goal vs East Meadow ECNL (NYE), after a dizzying solo run past three East Meadow defenders. 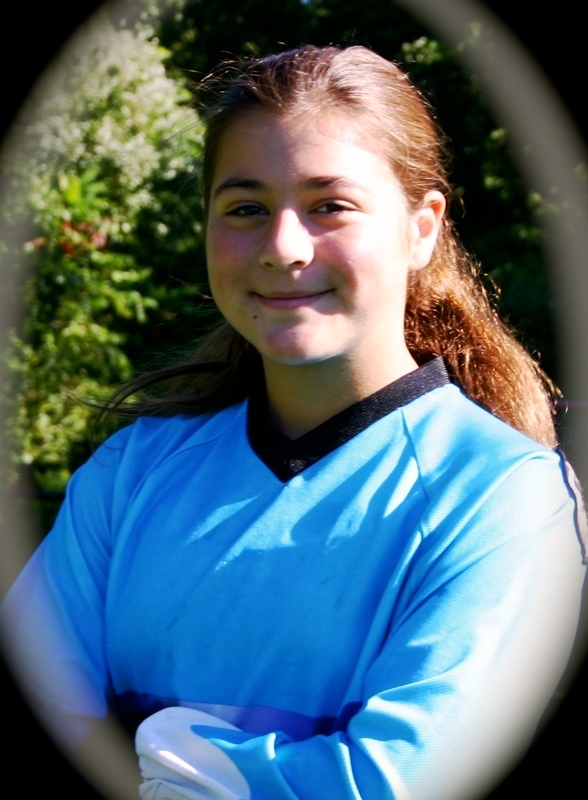 Coach Mones states, "Jessica is an extremely skillful and creative player who can play anywhere in the midfield or up front for the YUFC U14 Pride. Jessica's greatest strength is being very deceptive and dynamic on the ball. Jessica is never afraid to drive at defenders and has developed a unique knack at scoring and creating many goal scoring opportunities for us." Jessica is from Bridgeport, CT and is in her 5th year at YUFC. Samantha scored 2 goals at the Pennsylvanian Classic College Showcase in Lancaster Penn. this past week.Samantha recently completed an outstanding Fall High School season at Notre Dame HS in Fairfield were she set a school record scoring 25 goals leading her team to its first ever League and State Semi Final berth.She was named All State and All SWC. Her Yankee United Revolution u16 team will be heading down to the Girls Disney College Showcase,one of the most prestigious college showcases in the country December 30,31. Congratulations and Good luck to Sam and her teammates. 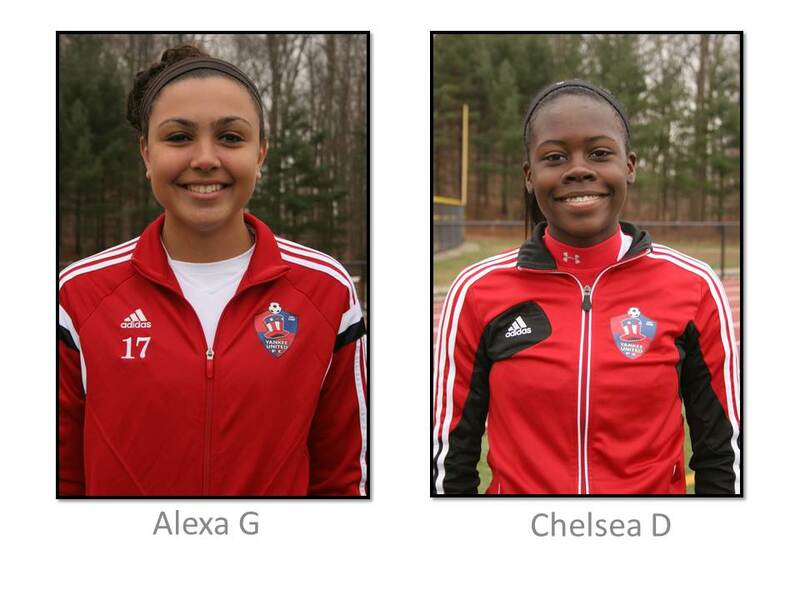 Alexa G scored 2 goals and Chelsea D scored 3 in leading the Yankee United FC Revolution u 16 team to a 3-0-1 record at the prestigious Disney College Showcase. In the first game, played at the Wild World of Sports Disney complex in front of 51 college coaches (click here for complete list) Yankee fell behind to Worcestershire County Schools FA of England with Forward Chelsea D scoring the first goal to tie the game at 1 all. With Yankee behind and 10 minutes remaining, Center back Alexa G was moved up front scoring the game equalizer. Yankee midfielder Briana K, with 2 minutes remaining, slotted a ball in side of the English goalkeeper to win the game. The Yankee Revolution team advanced to a 4th day final round 4-1 victory over Triangle United 98 Gold the # 5 ranked team in North Carolina with both Chelsea and Alexa scoring a goal. The u16 Yankee girls hope to continue their success with a complete Spring College showcase schedule that includes the Jefferson Cup ,Manhattan & PDA. 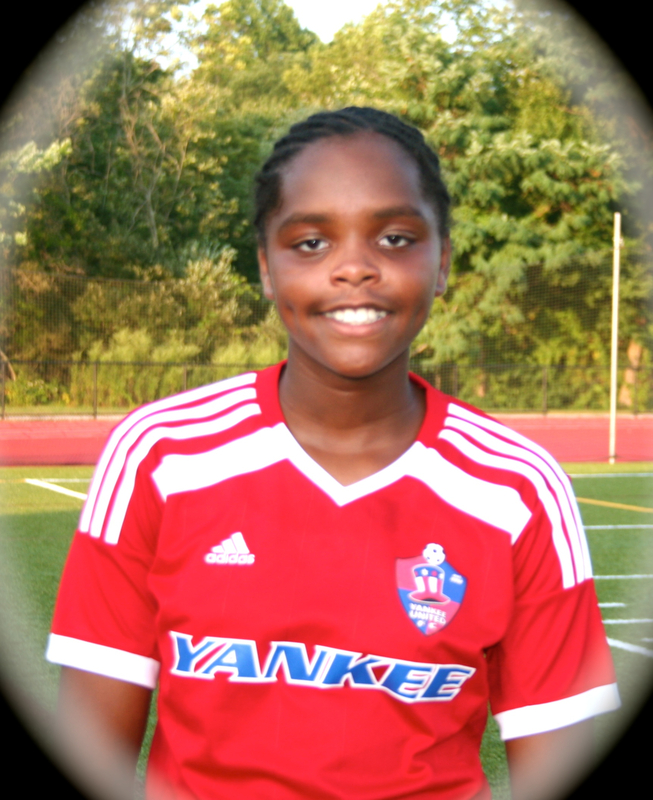 Antoinetta D. (Tony) helped the U-12 Yankee United Reign-02 Blue capture the 2014 FC Stars Cup Championship this past Labor Day weekend up in Taunton, Massachusetts. The U12 Reign went undefeated on the weekend amassing four wins against four highly ranked regional premier teams. On the weekend Tony scored the opening goal vs the #2 ranked team from (NYE) Manhattan SC Power NPL in a 3-2 W for the Reign. Tony again scored the game opener against STA MORRIS UNITED NPL-02 (NJ) which ended in a 4-1 W. Tony was the MVP of the Championship game scoring two stunning goals to lead the YUFC Reign to 3-2 victory over the current #1 ranked team in the country Rage FC Premier Renegades (NJ). Tony's is from Bridgeport, CT and is in her first year with the team. Coach Rui Rainho states, "Tony brings a different dynamic that compliments the team very well. She has tremendous technical ability and a real knack for scoring goals. She is a very talented young player who shows a lot of promise." 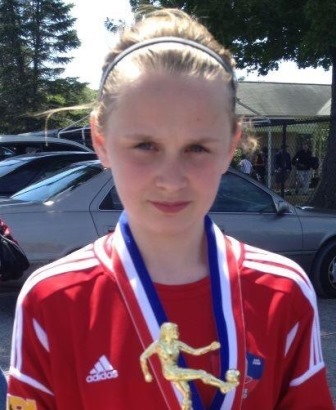 Susan M. helped the U-12 YUFC Reign NPL 02-Blue to a 2-0 shutout win against GPS Elite (#4 Ranked Team in Mass) Susan had an outstanding game and prevented many scoring opportunities frustrating the GPS attacking players all game. Susan is from Monroe, CT and is in her second year at YUFC. Coach of the Reign Rui Rainho states, "Susan has always been an important member of the team. Against GPS she was very agressive winning many tackles and quickly starting our attack. Susan has a very bright future ahead of her." 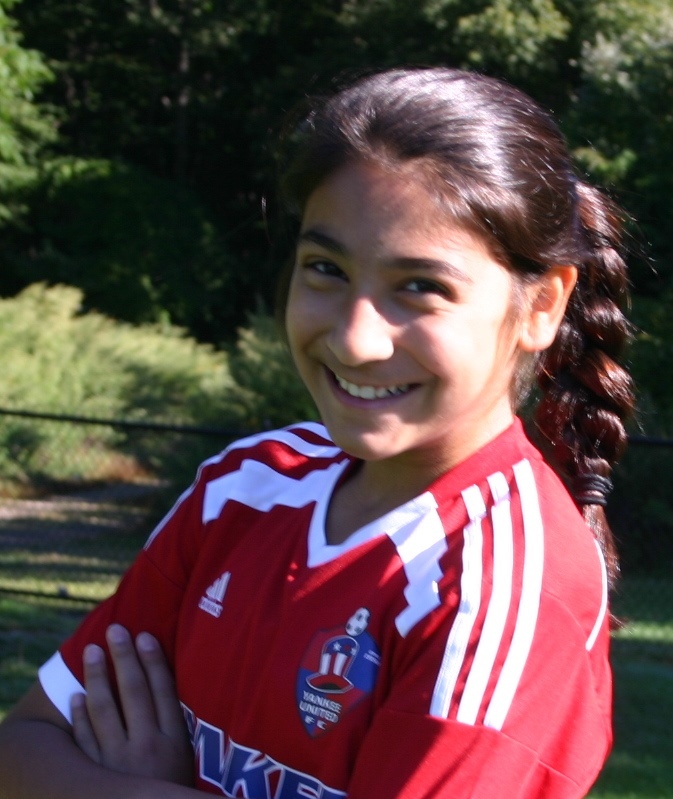 Tia P. lead the U-13 YUFC BLAST NPL-01 to a 2-0 shutout win against Syracuse Development Academy (NYW) this past weekend at Oakwood Soccer Park in Portland, CT. This was the third recorded shutout for Tia on the season. Tia is from Shelton, CT and is in her second year at YUFC. Coach of the Blast Matt Mones states, "Tia is a great athlete with unbelievable instincts in net. Every week Tia gets better and better, she is aggressive, has soft hands and is one of our leaders on defense. 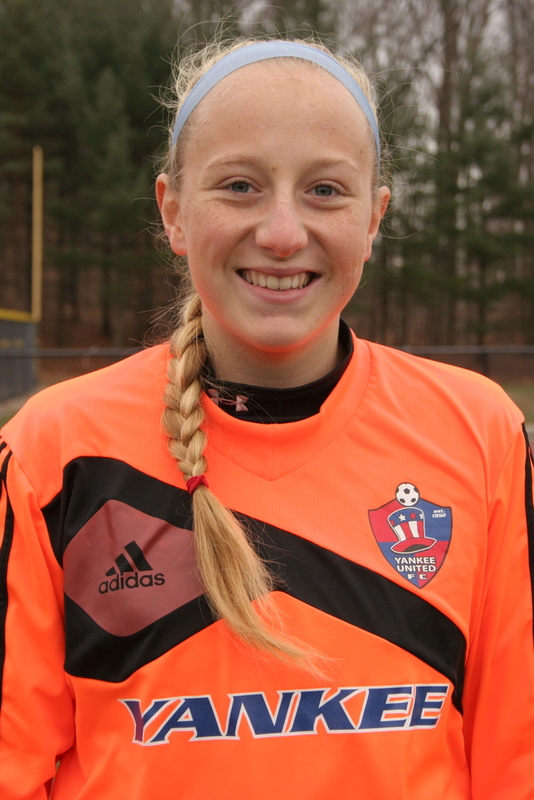 YUFC GK Coach Drew Nucifora does a tremendous job with all the Yankee goalkeepers and I am confident with Tia's work ethic and Drew's specialized training/guidance, Tia will flourish into one of top goalkeepers in the state of CT."
Kasia Z. supported the U-14 YUFC Flash in a 0-0 draw vs the # 5 nationally ranked NEFC Elite in league play this past weekend. Kasia did a tremendous job defensively with the NEFC forwards. She also got involved with the offense and created scoring chances. Kasia was born in Poland and currently resides in Ansonia, CT. This is her fourth year with YUFC. 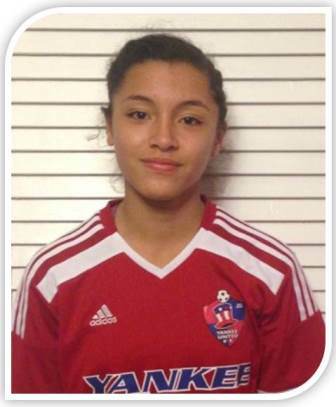 Melissa is a very strong left footed defender who consistently displays her strength, speed and skills each week. She is aggressive and also engages in attacking plays which she has found the back of the net with her powerful left strike throughout this season, including the lone game winning goal against the highly ranked Seacoast United Elite team in league play. Melissa resides in Shelton, CT and has been with YUFC for two years.